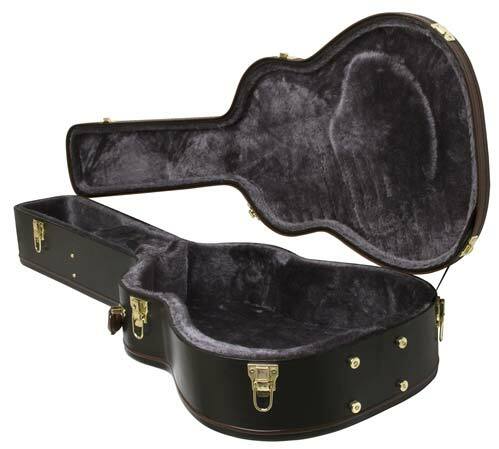 Shop Epiphone EDREAD Acoustic Case For Dreadnought AJ DR and EJ160 Series from AMS with 0% Interest Payment Plans and Free Shipping. This Epiphone guitar case was designed specifically to fit the Epiphone John Lennon EJ160E Acoustic Guitar, the Dove, and other instruments. It provides top quality protection for your investment. Great case. It does what it's supposed to do. Wow! A lot lot better case than expected. Very plush and fits the Materbilt like a glove. Feel very comfortable with my guitar in this case. Guitar fits perfect and very nice looking. Very well made also. Well worth the money. Really nice, well appointed case. This case perfectly fits the Epiphone Hummingbird A/E that I ordered it for as well as my Art & Luthrie 12 string so I’m eventually going to get another for the 12 string. Very well made and great looking case. Its a pretty case and it does the job but I feel like the trim and the leather is not going to hold up for too long. Otherwise it's very nice.
" Love this case "
This by far the most heavy duty and plush guitar case I have ever owned I now own two. Extreme quality the day that I put my order in for my dreadnaught guitar EPIPHONE, I showed a girl I know the picture of the guitar and Case on my IPhone because I have the same guitar and Case for about a year now, upon seeing it she called and ordered the same guitar and case, especially when I told her about the 5 Payment plan. I have been doing business with American Musical Supply, for 26 years I have purchased 5 guitars, 2 EPIPHONE guitar cases, and a Marshall Acoustic guitar Amplifier, and I always Recommend your Company to any musician I meet.